THE ULTIMATE BAR - ON-SALE NOW! 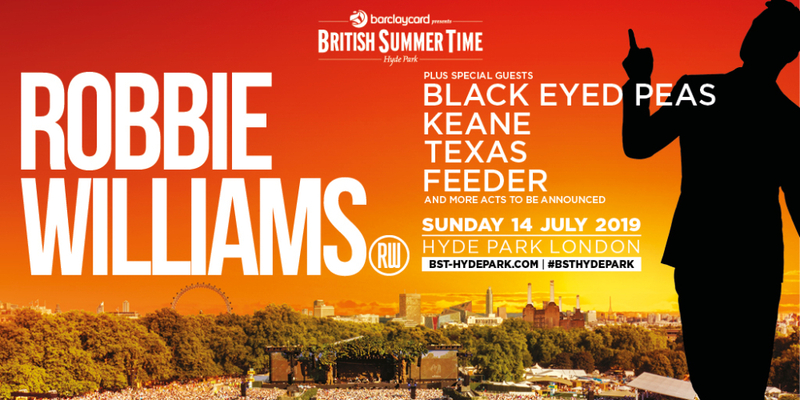 Robbie Williams to headline the Great Oak Stage for his only UK open-air show of 2019 with Special Guests to be announced - Barclaycard presents British Summer Time Hyde Park London announces another huge headliner for 2019 – Britain’s greatest entertainer – Robbie Williams. Provisional Times - Main Gates Open: 13:00H – please note the gates will be open approx. 60 minutes early for those customers who have Diamond View and Barclaycard VIP Summer Garden tickets * The Ultimate Bar * Opens @ 12:00H or arrive at your leisure. Age restrictions - Anyone under 16 must be accompanied by a parent or guardian (18 or over) - Disabled Access - All tickets are available via the festival website or AXS.com. There is a Wheelchair platform and an Ambulant area. All tickets come with 1 free personal assistant. We regret that special access tickets are only bookable via the BST website.